MISSION ESL COMPUTER LAB: "Mesa Verde National Park"
I'm Steve Ember. And I'm Barbara Klein with EXPLORATIONS in VOA Special English. Today we tell about a large National Park established to protect the culture of ancient Native Americans. It is called Mesa Verde. It was cold that day in 1888 in southwestern Colorado. Richard Wetherill and his brother-in-law were trying to find some missing cattle. They were up on Mesa Verde. Spanish explorers had named the area. The high, flat mountaintop is covered with many green juniper and pinon pine trees. It looks like a huge green table, which is "mesa verde" in Spanish. 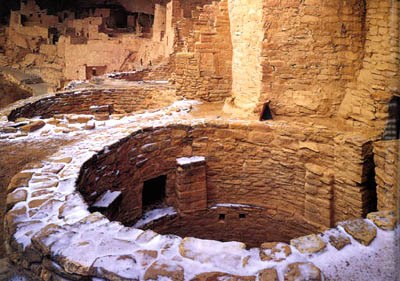 The ruins in Colorado had been home to the ancestors of the present day members of the Pueblo tribes. They were named Anasazi, or ancient ones, by the Navajo Indians. They moved to Mesa Verde about 1,500 years ago and left 700 years ago. They built the cliff dwellings in Mesa Verde toward the end of the 800 years they lived there. One of the earliest visitors was a young man from Sweden, Gustaf Nordenskiold. Mr. Nordenskiold spent months exploring the area. He traveled on foot and on horseback. He took pictures that were published in a book, "The Cliff Dwellers of the Mesa Verde." Gustaf Nordenskiold collected hundreds of objects he found in the ruins. He loaded them on teams of mules and sent them to the nearby town of Durango, Colorado. Local officials tried to prevent him from removing so many objects. But there were no laws to stop him. Mr. Nordenskiold shipped the objects to Sweden. Later, they were given to the national museum in Helsinki, Finland, where they remain today. Many people were shocked by the continuing removal of objects from the ruins at Mesa Verde. One was a woman named Virginia McClurg. She had visited the area and had explored a few small ruins. From 1887 to 1896, she campaigned throughout the country to get laws to save the cliff dwellings. She gave speeches describing the destruction of the dwellings by people seeking treasures. She worked for years with members of the United States Congress to get such laws passed. Finally, on June 29, 1906, President Theodore Roosevelt signed a bill creating Mesa Verde National Park. It was the first National Park designed to protect the works of humans. Then Congress approved the Federal Antiquities Act of 1906. The act helps protect ancient ruins on federal lands. Today, from a distance, Mesa Verde appears as it did centuries ago. It rises more than 540 meters above the floor of the valley. Visitors can drive up to the top of Mesa Verde on a winding mountain road. When you reach the top, you are 2,400 meters above sea level. In the distance are the flat lands and mountains of the Four Corners area. That is where the western states of Colorado, New Mexico, Utah and Arizona meet. This area has one of the largest numbers of archeological sites in the United States. Within the national park are more than 5,000 ruins from the time of the Ancestral Puebloan people. 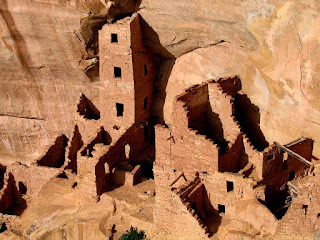 Six hundred are cliff dwellings. Most of the ruins remain unexplored. Some have been uncovered and supported to make them safe to visit. These ruins are open to the public during most of the year. During the winter, activities are limited. The visitors' center at the park is open during the summer. The museum is open all year. Some of the ruins in the Four Corners area are from the earliest people who lived there. They were hunters and gatherers, now known as Basket Makers. The Basket Makers lived in simple caves. Their civilization existed 2,000 years ago. 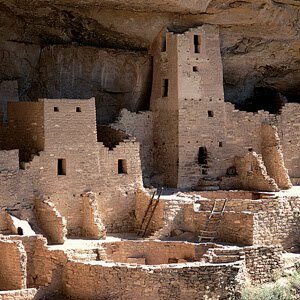 The first evidence that ancient people had moved to Mesa Verde is from about the year 500. Those people lived in pit houses. Pit houses were large holes in the ground with roofs of wood and mud. In about the year 750, the early Pueblo people began building square structures of large connected rooms, or pueblos, above ground. 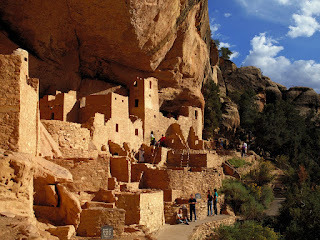 Finally, in about 1100, they climbed down the canyon walls and began building cliff dwellings. Today, visitors to Mesa Verde can see some of the remains of all four kinds of settlements. Cliff Palace is the largest cliff dwelling in Mesa Verde and also in North America. It has 150 rooms. It is difficult to get to it. Visitors must climb down into the canyon on a narrow path with many steps. They must also climb down several ladders. But the trip is well worth the effort. Visitors can examine a huge and beautiful structure made of stone and clay. 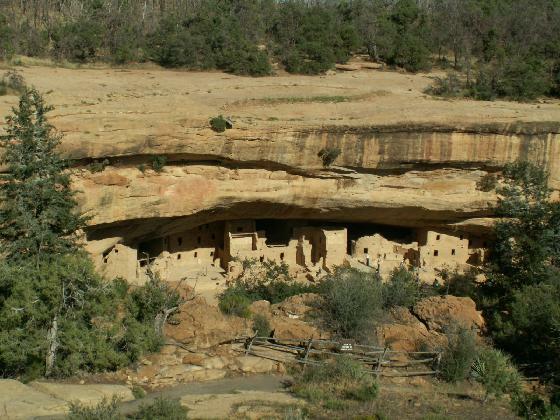 Spruce Tree House is the third largest cliff dwelling in Mesa Verde National Park. It has 114 rooms. It also has eight underground rooms called kivas. The Indian men gathered in the kivas for special ceremonies. About 100 people lived in this cliff dwelling during the 13th century. About 500,000 people visit Mesa Verde National Park each year. The park's archeologists have recovered many objects that the ancient Pueblo people used, including pots, tools and jewelry. Many of the objects are shown in the visitors' center. However, human remains or any object from a grave may not be touched or shown. This is to honor the wishes of the modern Puebloan people who live in the area today. Mesa Verde National Park occupies 21,000 hectares of land. However, only about ten percent of the area has been explored. Mesa Verde is recognized as a special place. The United Nations named it one of the first World Heritage sites in 1978. Special events were held at Mesa Verde during its one hundredth anniversary in 2006. They included tours of areas never before open to the public. This program was written by Marilyn Christiano and Shelley Gollust. It was produced by Mario Ritter. I'm Barbara Klein. And I'm Steve Ember. Join us again next week for EXPLORATIONS in VOA Special English. 1. The Four Corners area of the United States is where ________________________ . 2. The Basket Makers lived in ______________ about 2000 years ago. 3. "Mesa Verde" is Spanish for "__________________" in English. 4. The cliff dwellers ___________________________________ . 5. The Navajo call the cliff dwellers "_______________" which means "ancient ones". 6. Richard Weatherill showed objects he had collected to people in nearby towns. The people ____________________ . 7. First, Gustaf Nordenskiold shipped many objects he collected at Mesa Verde to Sweden. Later, he _________________________ . 8. A tourist would not likely see _______________ while visiting cliff dwellings at Mesa Verde. 9. Virginia McClurg worked very hard to ____________________________ . 10. "The Cliff Dwellers of the Mesa Verde" was written by ________________ . 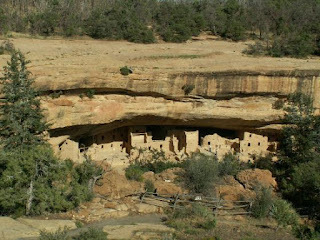 Here is a Youtube video about Mesa Verde National Park. Translate button. Select your language.